This is another sandwich precipitated by the purchase of the rye loaf mentioned previously. In this case, the meat was a similar impulse buy. 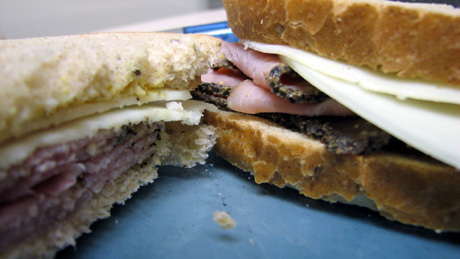 I like ham  and I really like pepper , so pepper-encrusted ham seemed like a natural choice. Can’t say I regret it in the least. And who doesn’t like ham? Besides Jains, Jews, Muslims, Seventh-day Adventists and Rastafarians, I mean. I’ve pissed a lot of people off by indulging in one of my favorite beverages, piprapiim (‘peppermilk’). I came up with it myself, and nobody else likes it. Which is fine, because there’s more for me that way.